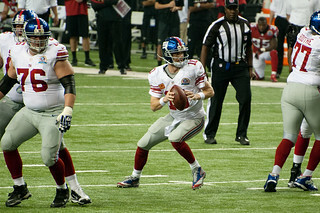 New York Giants quarterback Eli Manning looks to find an open receiver during the Giants game against the Atlanta Falcons on December 16, 2012 at the Georgia Dome. This photo is licensed under Creative Commons. If you use this photo within the terms of the license, please list the photo credit as "Seatacular" and link the text to seatacular.com. For usage questions, please contact us through Flickr.